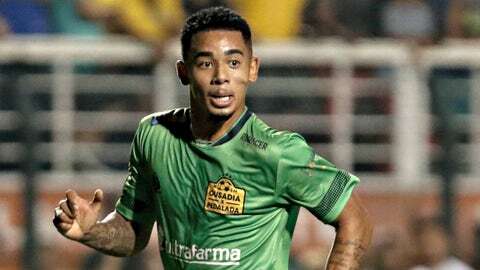 Break out the champagne, your Ballon d’Or winner for 2020 is … Gabriel Jesus! That is, assuming Jesus’ former coach can predict the future. Jose Francisco Mamede coached Jesus at the Brazilian’s first club, Pequeninos do Meio Ambiente de Sao Paulo, and he’s not afraid to heap the expectations on the 19-year-old. “In three years he’ll win the Ballon d’Or,” Mamede said, via the Manchester Evening News. That might be tough, especially with Cristiano Ronaldo and Lionel Messi showing little sign of slowing down. That duo has had a stranglehold on the award for nearly a decade, with Kaka the last player not named Messi or Ronaldo to win it, back in 2007. Mamede has it mapped out, though, “because Messi will already be getting a bit old,” by 2020. At that point, Messi will be 32 years old and Ronaldo will be 34. Nevermind that they’re two of the best players ever. Or that there is a host of other players out there that, in the event the Messi/Ronaldo Ballon d’Or duopoly is broken up, would have a strong claim for the award. Jesus hasn’t even played a minute for Manchester City yet, but the hype has already reached the point of ridiculousness. Beyond the “next Neymar” designation, now he’s a future Ballon d’Or winner. That’s not to say he can’t reach those levels. It’s just to temper expectations on a player that is still a teenager. Maybe, just maybe, let the kid play a bit in Europe before giving him one of the world’s most prestigious awards.